Mercedes-Benz LA Fashion Week Fall '08 collection begins at the Smashbox Studios in Culver City. Four shows started the week of fashion including Imasu by Kelly Nishimoto, Orthodox, Julia Clancey and Whitley Kros. It was a weak start with few interesting looks from any of the designers. 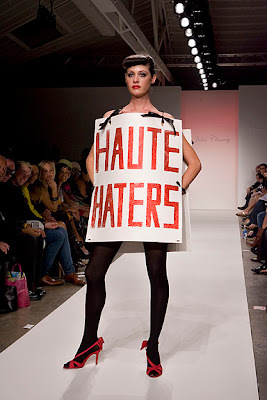 Whitley Kros was the most popular of the shows followed by Julia Clancey's collection which included a political protest message to the US Customs Department.